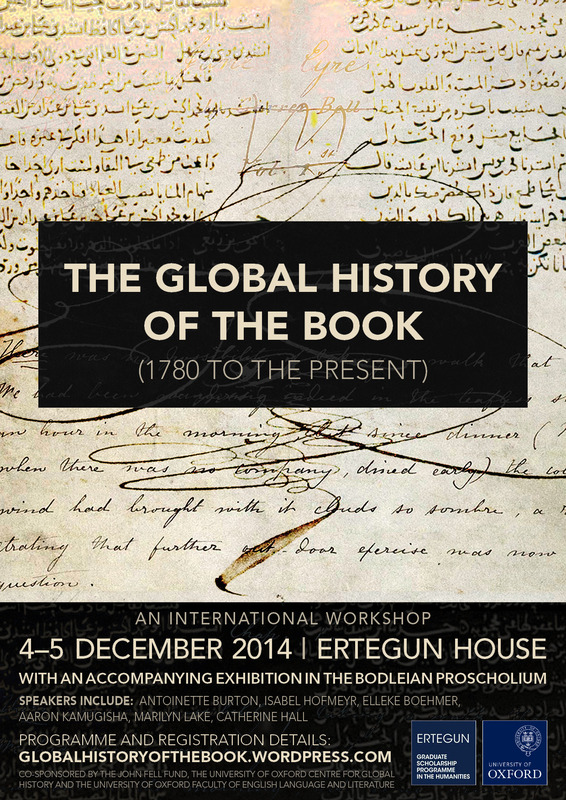 The Global History of the Book (1780 to the present) was a two-day interdisciplinary workshop organised by doctoral and postdoctoral researchers in conjunction with the English Faculty’s Postcolonial Writing and Theory Seminar, the Oxford Centre for Global History, the John Fell Fund and the University of Oxford’s Ertegun Graduate Programme in the Humanities, that was held on the 4th and 5th of December 2014 at Ertegun House, Oxford. The aim of the workshop was to explore the global alongside the local, transnational and inter-imperial, textual and intertextual, dimensions of book history. Be it the book’s ability to travel, or its intervention in cultural politics, we were particularly interested in papers that would demonstrate the crucial role that writing and print plays in the making and materialising of global history. The workshop had two main strands. The first strand comprised a panel discussion with Antoinette Burton and Isabel Hofmeyr, the editors of Ten Books that Shaped the British Empire: Creating an Imperial Commons, a collection of essays forthcoming from Duke University Press (2014). They focused on the critical implications of their project and new trends in Book History. This was followed by readings and discussion with other contributors to the volume (speakers included Marilyn Lake, Catherine Hall, Aaron Kamugisha and Elleke Boehmer). The second strand involved papers by graduate students and early career researchers, furthering the conversation of the plenary panels.